“The house you own will be worth less and the rent you pay will be more (and) Labor just doesn’t understand this,” he said. “It’s not just homeowners being hit, it’s renters too. For the thousandth (but certainly not the last) time, let’s debunk Scott Morrison’s rent lies. Again, unwinding negative gearing would merely turn renters into home owners, leaving the rental supply demand equation unchanged. Third, Labor’s policy will direct negative gearing into newly constructed dwellings only, thereby boosting overall supply (other things equal) and placing downward pressure on rents. Because of this, one Sydney developer this week claimed that Labor’s policy would be a “shot in the arm” for the off-the-plan market. The Real Estate Institute of Western Australia (REIWA) also recently argued that Labor’s policy would make rents more affordable, whereas major developer Stockland stated that Labor’s policy would put a rocket under new home construction. Of course, this is precisely the stated objective of Labor’s policy: to put taxpayer subsidies to work to boost supply and lower both prices and rents. Therefore, how can Scott Morrison credibly support restricting foreign buyers to new builds because it boosts rental supply, jobs and growth, but not negative gearing? His position is utterly contradictory. Finally, landlords in Australia already charge what the rental market can take. It is a ‘market’ after all, not a charity. Landlords don’t keep rents low just because they receive negative gearing benefits. Nor will they be able to magically lift rents if/when negative gearing is removed. Remove negative gearing and prices would fall, lifting rental yields. It’s hardly rocket science. Scott Morrison’s negative gearing rent lies have been debunked so many times, it’s hard to believe he can make these statements with a straight face. It’s time to send him to the electoral guillotine. Surely the Government has received advice from Treasury about the impact of these reforms on prices and rent? Has anyone submitted a Freedom of Information request on this topic? Simple answer – it’s an inconvenient truth. I’m not so sure I can see where you’re drawing a parallel here.. care to elaborate a little more? reds (communists) under the beds was a Lib scare campaign that was regarded as weak. Shorten tried mixing humour with his politics and his Dad joke game was found to be weak. He doesn’t have the charisma of Hawk and has the brains to realise it. He needs a distraction after allegations that his handpicked Liberal star candidate (former Labor and Lib Dem member) Warren Mundine) beat up his wife. Warren Mundine’s first wife Jennifer has claimed the aspiring Liberal MP was physically violent after the couple’s marriage broke down in the 1980s, accusing him of hitting her on one occasion. Liberals – perhaps their coat of arms should be the Ouroboros of Incompetence. Josh FrydenShameless and he are just doing god’s work – without question. How very Game of Thrones. I could see Bronwyn Bishop as the poisonous Olenna Tyrell. Some of his LNP mates call him Joe Fry. I prefer the GoT Joffrey reference. Does it matter if he is lying though? It all depends on whether it is a vote winner or not. For inner city types (Syd, Mel) who have seen an explosion in house prices and are still desperate to get in a crash would be very welcome as long as their income stays constant, they still have a job and the AUD doesn’t plummet all which I doubt. For everyone else (and Australia is a big place) anything causes an income/credit recession is probably a huge negative in the medium term (10+ years). Sadly I do see these changes as accelerating any downturn and potentially causing an economic crash as the credit impulse completely dies especially under current conditions. It doesn’t matter if he is lying or not – the question “is he on my side? will he protect my living standards?”. People are tribal and look who will protect their interests; facts don’t matter as much as people think. Saw this in the US elections too. True dat, never bet against greed, especially not when it comes to baby boomers, they will do what ever it takes to preserve what they believe they are entitled too, getting wealthy off the backs of anyone else ! Or recent first home buyers who bought in the last 4 years or so saving hard for a deposit OR people working in construction (every tradie) OR people with 1 investment property OR home owners with a large mortgage that don’t want to be in negative equity OR workers that aren’t exposed to an export sector (i.e. most inner city workers) OR … I could go on. I actually think boomers as early entrants to the property cycle are in the best position in the event of a crash mostly. It doesn’t need to be greed that drives his message home; it can be fear. Based on my limited understanding of economics and credit given recent house price falls already it isn’t unjustified fear either. The scare campaign has “facts” not lies to make it work even if they aren’t in the direct text he is saying. Please stop using that thumbnail picture of Morrison when writing articles about that smug puddle of diarrhoea — it makes me want to punch something. A picture of his supreme smugness (a la Costello) topped by turd hat might be bearable, to call out his hypocrisy? The simplest way to reform NG would have been so set a Cap on deductions, i.e 10K per person. this can then be easily adjusted up or down. How will it be determined if a house is new? will there be a limit on the time from when it was built, or is it still new if someone have not lived in it since it was built. If there are no clear cut rules on this it will be open to all sorts of rorts. So many ways the NG reform could have been done. It’s far from perfect but it’s politically palatable. But the reforms will still drive a steak through its heart. Why not a cap on tax concessions say 15% per tax payer? How can it possible be true that prices will go down and rents will go up? Frydenberg also says this. Someone should nail them for this total logical fallacy. And if they respond that landlords will respond to falling prices by putting up their rents, just because they can, ask them why they aren’t putting them up now, since they apparently can do what they want. That’s exactly the point everyone is making. The LNP is trying to use the politics of fear on the herd, sometimes it works and sometimes the herd goes “yeah, nah” and ignores them. The main issue these muppets are avoiding is that if property goes down, more renters will become first home buyers. This will take the pressure off the rentals and keep rent prices stable. The only issue will be if Labor institutes its NG policy and the punters forget that prices were already dropping substantially before it was implemented. People love to blame something and there is no doubt the LNP will double down on the “NG change kills the real estate market” lie. There is a question how much the oncoming threat of Labor coming into Government is affecting investor behavior now – I would say currently it is the biggest threat on prices right now. Most of the people I talk to think this is the main reason why investing in property right now is dangerous. The RC report, IO resets, etc eventually wash through the system; then people forget why they were ever a problem and it slowly comes back. However NG/CGT changes are a lot more permanent and hard to unwind politically. Labor doesn’t need to be in Government to cause the effects of their changes – they are jawboning with great success since it is likely they will take government and as a double bonus they can cause the negative price effects while the Liberals are in charge. Politically its genius. AK, I see your point but have a completely different view. Potential NG changes are not the biggest effect on investor behaviour right now, the inability to get funding is. This is due to the Royal Commission and the banks finally doing what they should – responsible lending. 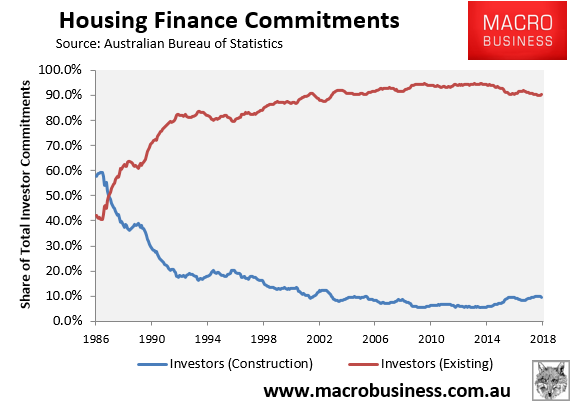 If anything the NG changes should pull investor spending forward, as Labor says it will Grandfather any properties that are negative geared before the changes are made. That would encourage the real money to get in now. People that are put off or frightened by the thought of NG changes are all talk. They are unlikely to actually put their money where their mouth is. “AK, I see your point but have a completely different view. ” – Then we have to agree to disagree I guess. What I don’t understand from what you have said is they will buy anyway even if they are frightened of NG/CGT changes? Frightened people don’t go rushing to the bank demanding more credit which is for most people a massive financial decision. 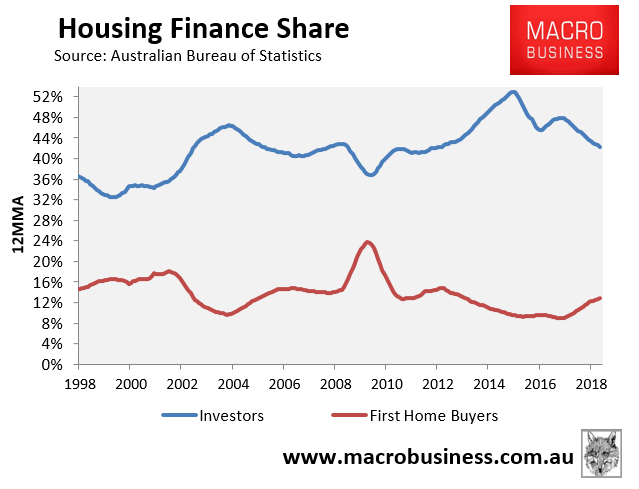 Funding plays a part but recent articles (incl here on MB) have mentioned demand falling for housing credit even before funding constraints (https://www.macrobusiness.com.au/2018/12/nab-lack-demand-not-credit-behind-house-price-falls/). Grandfathering won’t affect buyers soon hence any seller will have to discount to make it worth it to the new buyers coming in (i.e. more price falls). All these thoughts would be playing into every home buyer right now. The question I ask: would you buy knowing Labor will most likely get in this year? A lot more people are saying no to this question right now which is why Labor have every incentive to at least say they are pursuing this policy in full. It just causes more and more political and short term economic damage to the Liberals and the economy (in the short term) when they do. No AK, you have cherry picked a positive funding article from last year. NAB will happily fund people – if they have a 20% deposit and an AAA+ credit rating. NAB will no longer fund Interest Only loans, 100% loans, 5% deposit loans, people on $80k a year with five other investment properties and many SMSF buying into overpriced small apartments. I hope that smug piece of stool never returns after the election. Labor would not be a good choice for renters who intend to continue renting. Is this the new core constituency of the Liberal party? Labor needs to point out loud and strong that first home buyers, the cornerstone of the Australian dream, has dropped from 25% to 12%. Aussie kids don’t have the same advantages their parents had. They also need to point out that Aussie home ownership across the board has dropped from 80% to 60% since NG was introduced. This shows that NG forces prices up and a generation out of home ownership. NGs been around since the 30s. The LNP seem to forget that at the next election 50% of eligible voters (18+) will NOT own any real estate, investment property or otherwise. For them, a drop in house prices is a beautiful thing. Those who are current owner-occupiers out number investors roughly 7 to 1. Many of them are starting to realize that a drop in the value of their home means a drop in the value of everyone’s home. It means they will have to borrow less and take on less debt if they want to upgrade or locate to a better/bigger home in a nicer location. Mortgage loans will be smaller, not bigger. For them (and their children) the debt can be paid off sooner, rather than later. For them this is a positive outcome, not a negative. It applies to everyone looking looking to sell and buy in the same market. Unless of course you don’t mind selling and then living in a tent or under a tree. Investors and recent owner occupiers are in the minority, by far. Scummo has the political ability and judgment of a gnat.